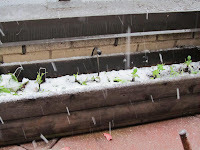 North East Snow Storm pelts my garden! Really Mother Nature? Snow in October? When I heard a snow storm was coming, I couldn't believe it. I chalked it up to another made for TV weather event. But I figured I'd better pick off all the greens that were still growing through the warm fall season, just in case. I had plenty of basil and a good smattering of salad greens, as well as a few peppers on the vines. But with the sun setting before 6 pm, I never got home from work early enough to catch the light. And I had a busy week with early mornings at the office. When I saw all the snow falling today, I rushed out in my rain gear and finally got to picking. I felt a bit like a migrant worker trying to save the crops from a hard frost. My fingers just about froze too. But it was worth it, as I did manage to salvage a reasonable amount of vegetation. Later on today, I'll roast the peppers. 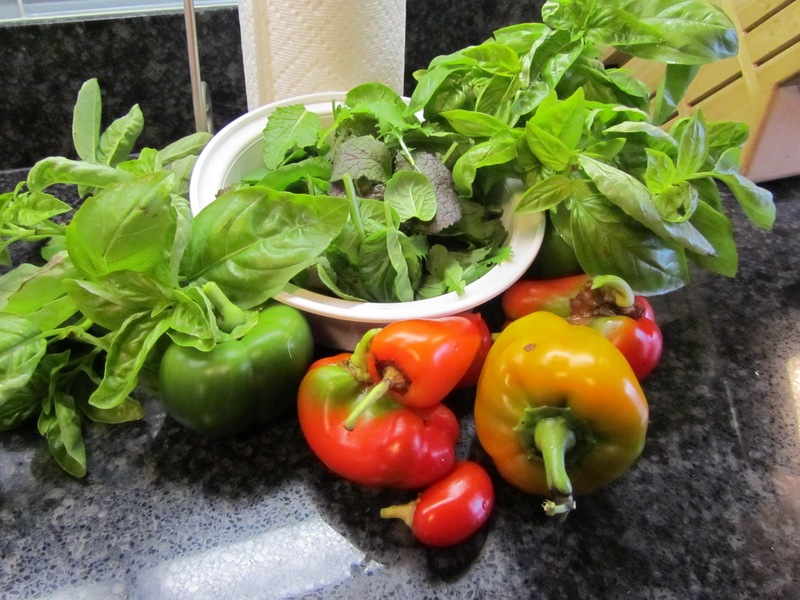 The basil will make a nice addition to a pot of tomato sauce. And I'll be having a fresh green salad for lunch. Yum. 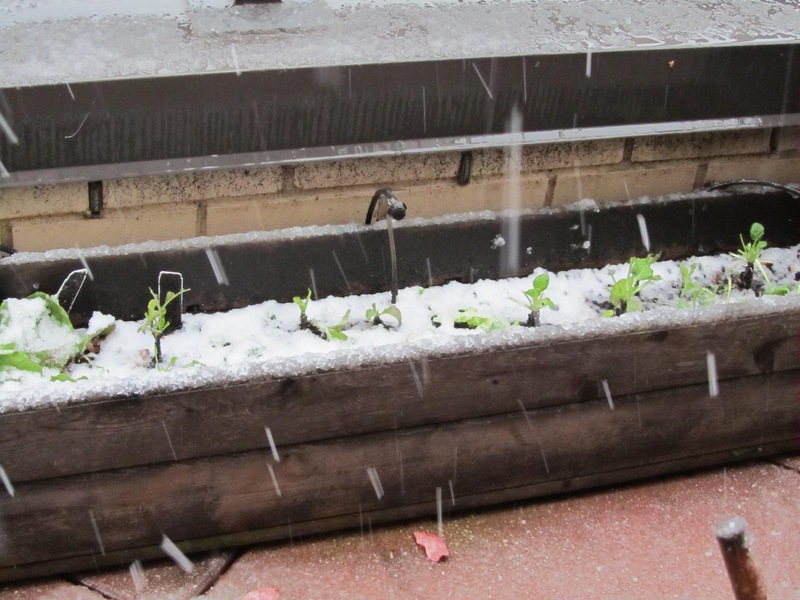 If this ends the growing season, so be it. This year we've kept a record of our harvest, which I'll post soon enough. We returned from Europe last week to find our garden still growing. 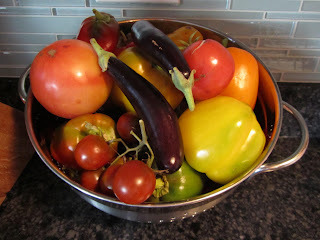 I picked a bowl full of tomatoes, eggplants, peppers, salad greens and herbs. Of course, the plants were nearly exhausted, so, what you see (left) is about what we got. The tomato plants, haggard and brown, will produce no more fruit. A few peppers are still ripening on the vines, and the eggplants even have new flowers. But as always this time of year, greenery is more of a tease. Despite the warm weather, I know the winter will come and nip any new growth in the bud. It's at this time that we take stock of what worked and what didn't. I regret planting the Little Finger eggplants. The Japanese eggplants of past seasons were much better tasting. All of our tomato plants rocked this summer, and seven was a perfect number. Though they took up a lot of room, they provided a bountiful harvest that enabled us to share our crop with friends and neighbors. The early red bell peppers were a nice addition and I was very pleased with the cukes and kirbies, though they did punk out on me after the July heat wave. We're already talking about what we'll plant next summer. As the cold weather comes, it will give us something to look forward too.